Afternoon all. A couple of lovely results yesterday with Mischief Maisy getting very well backed from 20’s into 10’s and getting a very good ride to win. That may well be the limit of her ability but we bagged it on the good day. Mister Bob drifted all day right out to 10/1 then duly did the business too so good results all round. Refulgence is finally, off the list. Just a couple to note that are running this evening. I think he’s a nice horse and potentially a bit better than his opening mark of 82 suggests. At Chester last time I think he hated the undulations and looked certain to want a bit further in time. A few of these have already played their hands in handicaps where as this lad looks cherry ripe for tonight. 9.10 Newbury – Siri & Severus – 25/1 & 16/1 2x 1pt singles. A couple to play against the field in the concluding handicap on the card. You have to be forgiving for both last runs but I’m happy to do so. Siri messed about in the stalls at Carlisle, got restless and missed the break. They went no real pace and she was always on the back foot and not persevered with. She is better than that and can prove it tonight. I’m astonished she’s 25/1, if you watch the video back from Sandown the time before she was desperately unlucky not to win what was a better race than this. Severus hated the heavy ground over a mile at Newmarket last time and drops back to seven on fast ground this evening. He travelled up strongly to a point that day and today should suit much more. They are both rated 72 but with the allowances Siri gets 8lbs off Severus so I slightly favour her. Play them both against the field of largely exposed beasts. Morning all. I hope today’s blog finds you well. Hopefully you are not a pound overweight and haven’t dispensed with your slippers in order to do todays correct weight. I have had to lose the shoes, bag, trousers, shirt, underwear and I’ve still been jocked off. Seriously what was Seb thinking? Have an actual full day off today which means you know the cricket season is coming to an end! I will be slouched on the sofa for a lot of the day watching the ODI and keeping my eye on events at New Road as we cheer Sussex to victory in the LV=County Championship. Obviously I want Sussex to stay up, but also tipped up Worcester for relegation. A win for Sussex today/tomorrow is close to a double whammy! I will also be finishing off my jumps horses to follow which I’ll be sending out soon. I’ll kick things off with a few stats from Proform. Simon and the team are holding training seminars on the Proform software throughout the Autumn at various locations around the UK. You can find all the details on the website if you click on the Proform logo it will take you directly there. One note of caution on those stats are that although Jed’s runners are running very well. He hasn’t had a winner but 7/8 have placed at prices ranging from 9/4 to 16/1. Three of those runners traded odds on in the run too. He has Desert Ruler entered in a couple of nurseries over the coming days who could be interesting. Iain Jardine’s horses are running well and he has Push Me entered in the 3.55 at Sedgefield today. He’s been pretty well backed but would need a career best. Still interesting to a degree. Good card at Salisbury today but I found it hard to eek out any value anywhere. I do think that MELODIOUS is worth backing in CGA “PERSIAN PUNCH” CONDITIONS STAKES at 4.50. She gets weight off the favourite and with the step up in trip arguably going to bring about a bit of improvement, there is a case to say she could be favourite herself. Flying officer is 8/11 and she is 15/8. Well worth backing at that price. I’m quite keen on the chances of STAR RIDER (6.45 Chelmsford) for Hughie Morrison. She loved the surface at Chelmsford when winning her maiden. She has hinted a few times on turf that she is still potentially better than her current mark and this is the weakest race she has run in this season. Back here with Charlie Bennett claiming 7lbs I think she is potentially on a really nice mark and is well worth a go. She is readily available at 5/1. They are the two for me today. Be back tomorrow with more bits and pieces. Morning one and all. I hope and trust all is well and that you’ve all been smashing in winners left right and centre. After a dismal day hosting Sussex vs Essex on Wednesday in the Royal London Cup (not due to the cricket, but due to the weather) I finally managed to get back on the horse on the racing front in the last 24 hours or so. Had a good go on Tasleet in the opener at York yesterday. My main bet of the day though was on the Godolphin filly Mistrusting in the last. After her win in the four runner handicap at Newmarket last week I’d convinced myself that she was a potential group horse. I think the way she travelled through the race yesterday lead me to believe that again, it was a nervy last 100 yards but she held on well, possibly just idling in front. I have started going through the videos, so within a few days we will have a nice big bank of eye catchers and horses to follow. Before we get on to today’s racing, just thought I should give a mention to the test match. It is a really flat pitch. A typical five day Oval pitch. The Aussies showed yesterday that if you get through those early overs, then the afternoon is normally a batters paradise. The next two days are set for very good weather, then there are storms and rain forecast for Sunday and Monday. The draw is available at 7/4 in places this morning. Providing England bat well later on today I cannot see this being anything other than a draw. I think the prices are wrong. I’ve backed the draw. If today follows a similar pattern to yesterday, then I expect the draw will be about 4/7 by the close of play. Tradetastic for all you that like to “cash out”. I’m still coming to terms with the fact that I can’t click a race replay on RacingPost.com whilst looking at a race. The basic membership is about £14 a month now, and £26 if you include all the tipping pages. Cannot imagine that anyone is paying for that. I use the basic package but only due to the fact that all of my notes are stored on the database. Once I upgrade my office computer, I think I many well transfer all my notes onto the Proform database so that it’s all in one place. Taking the videos off the website I’m sure is a big mistake. Found the opening race at York difficult. Plenty of possibilities, but nothing that leapt out for a bet. I don’t have a strong opinion in the Yorkshire Cup either. I wouldn’t be surprised if anyone of them won to be honest. 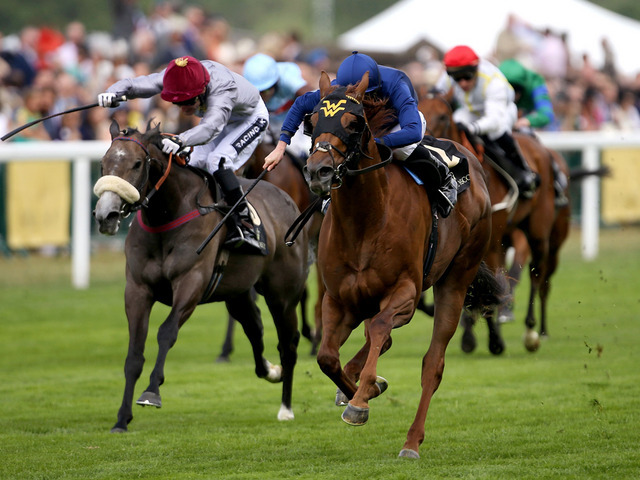 First bet of the day will be Richard Pankhurst in the Sky Bet City Of York Stakes at 3.05. I know he’s only had two starts and has had 426 days off since winning the Chesham last year but that was a really taking victory, one that suggested he was going to be better than listed class. He is in great hands and I’m sure he’ll be ready. He is a general 13/2 chance this morning, if that had been at this years Royal Ascot he’d be 6/4 so I think he represents value and if he is anywhere near his best; I think he’ll be really hard to beat. I will be having a small saver on Short Squeeze. He was given one of the rides of the season in a big handicap here last year by Smullen and he is back on board today. Whilst he is probably better at a mile, there is a good chance this will be frantic. Salateen, Toocoolforschool and Glory Awaits all have double figure pace figures on Proform so I’m expecting a strong gallop and this brings Short Squeeze into calculations. At 12/1 I’ll be saving on him. On to the feature race of the day the Nunthorpe at 3.4o and I cannot get away from ACAPULCO. She ran to a topspeed figure of 110 at Ascot. Only Muthmir (111) has run anywhere near that this season. She gets a 24lb allowance from her elders here which whatever way you look at it makes her very very hard to beat. Tactics may be important. There is the smallest chance things could get to her jockey Irad Ortiz Jr, who is not guaranteed to get the best of receptions from the patriotic’s. The Nunthorpe is a race that can throw up an odd result too. All things said, I honestly could’t go against her. I hope she wins. Whether she is bankable at 2/1 or not I’ll leave up to you. She might go in a multiple. I’ll jump to the evening card at Wolverhampton for the next interest. BUSH BEAUTY (8.20) is mildly interesting in the class 6, 6 furlong handicap. Normally better over slightly longer she needs a real test at six to figure but I think we may well get that tonight as Cloak And Degas, Captain Future, Bosham and Indian Affair all like to rattle along. We have to forgive the run last time but she has never shown much on turf. Back on tapeta she is drawn in stall 2 so Rachel Richardson can just pop out and take her time. If they go stupid up front then she will be a big player when they turn for home. She comes out top on the PROFORM ratings by some way too. She’s 10/1 in places this morning and must represent a fairly good each way bet. At Sandown in the opener I thought KOMEDY (2.20) may be interesting. She has a piece of form (debut) that would make her particularly interesting off an opening mark of 64. Her last run in a maiden certainly smacked of “nursery type” and the yard are in much better form than earlier in the year. I’ve had a small interest on her at 7/1. On a totally separate note, the Redskins went 2-0 in pre-season last night after beating Detroit 21-17, that unfortunately though does not tell the story. The first two quarters, the offensive line decided not to block for RG3, he got hit 7 times and sacked 3 more. He ended with a busted shoulder and a concussion. This is clearly unacceptable and this needs to be addressed as soon as possible. We moved the ball with ease once Colt McCoy came in. It was all too similar a story to last year when RG3 was in. The pocket was collapsing with ridiculous ease. I hope there is no skulduggery going on. For the first time I’m starting to think that it might be time to trade him as there are clearly some trust issues within the team. Have a good day today, be lucky. Well it has certainly been a while since the last time I rambled on. The cricket season as always takes up my time in the summer. As well as my frequent visits back to my second home in Zante. Unfortunately, the knee injury I’ve been ignoring for a year has finally taken its toll and I am pretty much done. Waiting for a specialist appointment which I’m told will take 6-8 weeks. We all know the actual spread is 16-18. My coverage of racing has taken a back seat as per usual over the main summer months. Which is probably not the best idea considering my flat racing far outweighs my jump racing analysis. Looking forward to tackling the racing again with some gusto into the back end of the season and into the all-weather (the boos from the back of the room can be heard all round). The first thing I’ll touch on will be the beloved West Ham. Overall I have to consider the summer a slight success. Whilst a lot of know it alls will say we were mad to part company with Allerdyce, they are also the people that don’t watch us week in week out. His gusto had gone. We started last season playing much better football, attacking with gusto and going after the better teams. Whilst I knew we wouldn’t sustain our top 4 place, to drop away like we did with such timid and poor performances it was clear the time had come. There were times in his reign that Sam got things bang on. The 3-0 win at White Hart Line was a touch of managerial beauty. There were other times when we had no plan B, selected weak teams because he felt we couldn’t win the game. He also relentlessly picked Kevin Nolan, which meant we had to play 4-5-1 to accommodate his old legs, which other teams worked out and took full advantage of. Nolan is his prime was a master at reading the game and knowing where to be. Last season, he was unfortunately way off the pace. The fact no side (even championship) has shown any interest in him says all you need. He will be Big Sam’s assistant in his next job (NAP). So we move onto the Bilic era. I think he was the right choice for now. I like his ethos and attitude towards the game and what he wants to achieve at the club. I couldn’t give two hoots about playing kids in the Europa League and an early exit. Means nothing. English teams that get in to the group stages have terrible records in the Premier League. Our sole concentration, should be on going to the Olympic Stadium next year on the back of a top ten finish and progress. A massive positive is the signing of Payet from Marseille. He looks a classy player with the ball at his feet. He can beat a man with trickery, pace and strength. His assist stats are phenomenal. Everyone saw at the Emirates last week what an asset he is going to be. Very pleased with the additions of Obiang and Ogbonna. My one criticism would be that on the back of Enner Valencia’s injury news we should have gone and got a striker straight away. Sakho is streets ahead of the others but cannot play alone all the time. Who knows if Carroll will be back, when he’ll be back and how long he’ll last. I still think we have the basis of a good squad and I really hope that a top ten finish should be doable comfortably. There are some really very average sides in the league this year. If Sunderland don’t finish bottom I’ll be shocked. They were a disgrace on Saturday. Players walking all over the pitch. Watch Cattermole for the 2nd goal. He don’t care. Cricket hasn’t been too enjoyable over the summer. Whilst I’m very much at the back end of my career we are playing the highest level we ever have down at Rottingdean. It shows. We are 4/5 players short of where we need to be in all honesty. Playing for a year on dodgy knee ligaments has all but done me in. For Sussex again it’s been disappointing. Thought the squad looked capable of challenging in the Championship this season but they have been poor. Managed to get to the quarter finals of the T20 Blast largely down to Luke Wright, but again a poor home performance (said that on repeat the last two years) meant defeat. Let’s just hope having Chris Jordan back for the final few games means that they can have enough fire power to leapfrog Worcester in the table and stay up. The positive about the cricket season coming to an end means that the NFL season is just a few weeks away! 25 days to be precise. Literally cannot wait this year. I will run a blog on a season preview at some point in the coming months. Could be all change this year. The Seahawks look like they are going to try and throw the ball. The Patriots have plenty of new faces and don’t look like they’ll have Brady for the first 6 weeks (still be 5-1). The Packers look very good, as do the Colts. There are a couple of cracking bets I’ve lined up at bigger prices but I’ll touch on them another day. With regards to the racing. I’m hearing from Proform Racing towers that a brand new feature is being prepared for the upcoming jump season called the Cheltenham Trail. It will preview up to 80 of the major races that lead to your Cheltenham Festival bets, with facts, figures, stats and trends. Looks a cracking development and I will give you more details as and when they come through to me. Looking forward to York this week. The Juddmonte looks an absolute belter with Gleneagles taking on Golden Horn. Time Test is no back number either. Should be the race of the year so far. Very much looking forward to seeing Acapulco in the Nunthorpe. She looked an absolute beast at Ascot and gets more allowances than the cast of benefit street. She might break the track record. Gutted that for the 3rd year in a row I can’t go. Bad planning on my part. I’m hosting Sussex vs Essex on Wednesday then on Coral TV duties the rest of the week. I must end this edition with a note to my beloved pal Bryn Jones who we tragically lost in a car crash in Zante at the weekend. So many fond memories I wouldn’t know where to start on talking about them. He was an infectious character that just made life great. He was my neighbour for a few years with his Mrs Cat, who for the record is just nothing short of a diamond. My heart goes out to her and all of their family. Bryn was 29 and a massive hammers fan. We went away together and always bumped into each other at Upton Park. We were together just a few days ago celebrating beating the Arsenal and being general boys amongst a crowd of gooners. The Zante family has shown themselves to be nothing short of remarkable in their efforts to support Bryn’s family. Saturday was a particularly tough day. Being so far away has not helped. Rest in piece pal. You know that every time I ever sing bubbles I’ll be thinking of you. Now have a word with the big man upstairs and get us in the Champions League. Morning peeps. One of those days today where several horses that I have been waiting for are all going and we seemed to have been found some opportunities. We will start proceedings with TELEGRAPH (2.55 Wolverhampton) who would surely have won last time out with better luck in running. He is currently down to his last winning mark of 57 (equal lowest) and should really have picked up the prize last time out when being trapped on the inside rail and having to be pulled back by John Egan on at least two occasions. As they turned for home both he and the well backed winner went for the same gap, the winner got it and again Egan had to switch, once he regained momentum it was too late and he went down by half a length. This today is a weaker race and whilst I respect one or two who are down to basement marks, I would be disappointed if Telegraph were not good enough. TELEGRAPH 2 pts win @ 2/1 with SKYBET (Best odds guaranteed). I really like the chances of CABAL (4.05 Wolverhampton) to follow up his victory from last week. He won well last week when pulling clear with another notebook horse that is also well handicapped after tanking through the race. This if anything looks weaker than that contest and with only a 4lb rise to contend with it is hard to see him not winning again. There is money this morning for the top two which is good news. They are regularly backed but rarely perform and it has pushed our price right out. CABAL – 4 pts win @ 3/1 with SportingBet. (BOG). Another with outstanding claims today is CELESTINE ABBEY (4.35) who with slightly more luck would have gone close to winning last time with a better run. Held up last the race developed around her and she never had a chance to land a blow. That was a 0-65 and she has dropped down to 0-55 company this afternoon with the handicapper also generously dropping her another 3lbs. This puts her just a pound above her last winning mark and she should be up to taking this weak affair. CELESTINE ABBEY 3 pts win @11/4 with Boylesports/Betway. I feel inclined to throw a point at LITTLE CHOOSEY (6.40 Chelmsford) who we backed last time. She didn’t have the best of runs, constantly wide and giving away ground. The winner that day was ridden by Ali Rawlinson and it’s interesting he takes this ride today as he is perfect for her. If he can sit as quietly as possible on her till as late as possible then I think she’s likely to go close in a race where several of these have something to find. LITTLE CHOOSEY 1 pt win @ 11/2 generally (BOG). The 7.10 at Chelmsford is an interesting contest and case can be made for several of the runners. There is so much pace in here however that I felt it might be worth chancing a point on LONG AWAITED. He ran well in some better races last term and might just find several of these falling into his lap late on if he is ready to go after a break. LONG AWAITED 1 pt win @ 7/2 generally. I will also place Telegraph, Cabal and Celestine Abbey in a 1 pt treble. Which pays 39/1 via oddschecker. Morning peeps. Left slightly frustrated yesterday as things didn’t go my way. At Chelmsford you had to be right on the pace to have any chance so that didn’t pan out. I thought we’d nicked a biggie on KRUZHLININ who went off at a BFSP of 22.4 and traded at 1.17 jumping the last but got chinned by the progressive horse in the race. That was an interesting prep run for his national campaign. I’m sure that plenty of you may have traded out in running for a profit. Bravo if you did. Unfortunate we’ve lost the jumping action today but we have two fairly decent Monday cards on the all-weather and I do like the look of a few. First up we got to the last race on the card at Lingfield (4.20) to back SEA TIGER. He’s not had much racing to date with just nine starts all told and has dropped right down to a basement mark of 45. He hinted (again) last time that a step up in trip might bring about a bit of improvement and he gets that today. My one worry about the race is that there is hardly any natural pace in here so this potentially could get messy. Hopefully Pat Cosgrave will go forward from stall one (has a sleeper in Munsarim in two) and just sit handy to pounce. We will need some luck and a bit of improvement but both are possible so at 20/1 I think we can throw a bullet at it. SEA TIGER 1 pt win @ 20/1 BET365 and William Hill. We have to back RAT CATCHER (5.40 Wolverhamton) later on too. He’s thrown in on some of his back form and has ben running well without winning of late. Although I think he might want six furlongs now this is going to be fast and furious and having been drawn in stall one, Rob Hornby will be able to take his time and pounce as late as possible. Obviously in this type of race we may need a bit of luck but if the gaps appear then I think he will go very close to winning and can’t see him out the frame. RAT CATCHER 2 pts each way @ 5/1 generally. The 2015 Challenge & Saturday blog! Morning all. Managed to witness Cambridge parking several double deckers in order to secure a 4th round replay at Old Trafford last night. Not the most riveting viewing for the neutral but a scoreline which means that Cambridge United’s financial future is pretty secure. Very much looking forward to our trip to Bristol City on Sunday, although far from impressed by the away allocation due to ground building works. I will put up my daily selections on the blog and each horse will be backed on a points system from 1-5 pts depending on the strength of the bet. For the purposes of the challenge, we will bet at £100 a point. This means that on average in need to make 22.5 points profit per month. A sum I am confident we can nail. Keep an eye on the staking, sometimes there will be two against the field which for me is still a very profitable angle in certain races. Now for the purposes of added incentive maybe if one of our friendly bookmaker representatives or indeed a few of them would like to take on the challenge, maybe we could agree to pay the profits at the end of the year to a few charities? The Injured Jockeys Fund, Racing Welfare & Heros? Maybe a few of you would like to offer even £1 a point or similar for the final points total in December? If anybody outside the bookmaking teams would like to donate then please do feel free to get in contact. My twitter is @markagrantham. Please feel free to share this with anyone that maybe interested in the head to head and we will see if we can make some money for charity at the same time. So there really is no time like the present…… let’s get this started! A superb days racing today with trials day at Cheltenham plus Skybet Chase day at Doncaster. Most of my attention betting wise though will be centered around Lingfield. First off in the 1.25 we have two interesting runners to concentrate on. Firstly SASKIA’S DREAM went into many notebooks at Chelmsford on the opening day when she stuck to the far rail when most of the winners that day had come up the middle of the track. The negative is she doesn’t win very often but having said that her last win came off 61 and she’s in here off 57 so from a handicapping point of view there is a lot to like. She’s only got 8-13 to carry off bottom weight and is of major interest. The other one in the race that is really interesting is HUMOUR. Looked all over the winner at Wolverhampton last time and traded very short in the run before getting collared on the line by an in-form rival. This drop back to sprinting might just be ideal and should be backed. SASKIA’S DREAM 1 pt win @ 11/1 generally, Humour 1 pt win @ 12/1 generally. Jump to the last race of the day (4.20 Lingfield) and I’m keen on the chances of KODIAC LADY. She hinted on handicap debut last time that a mark of 60 is going to be well within her compass. There is not a load of pace in the race today with several stalkers that will be held up. With Luke Morris up I expect him to just sit in behind the pace and look to make good use of her off the bend. She looks to be overpriced to me at around 8/1. KODIAC LADY 1 pt each way @ 8/1. A cracking days racing at Cheltenham today but I failed to feel overly strongly about anything. Really looking forward to seeing Peace and Co again. I know he ran big on all the figures at Doncaster but the thing that lit my fire the most was his hurdling. It was electric. He reminded me of a young Harchibald on how slick he was from one side to the other. I hope he wins really well today. Wednesday Blog: Crossbar is in pieces….. Morning campers. Well yesterday left me feeling like ten rounds with Mr Tyson. Dream Child drifted like a barge on Betfair and was around 8/1 at the off then duly won on the bridle like the well handicapped horse I expected. Anton Chigurgh got smashed all the way down to 11/8 but again there was absolutely no pace on which has cost him as Danny Brock used up loads of petrol to get to the front. Game over. Then Logan’s Lad after being smashed to pieces in the betting again ran a blinder, but was trapped six wide the whole way round and actually went via Milton Keynes to try to win. That effort can firmly be marked up and he is very capable off his new mark. You have to love the game when getting so much right, yet you’re still wrong! On to today’s action and we have just one runner from the eye-catchers today. A horse that won really well for me last time at Sandown in the form of ONLY TEN PER CENT (5.20 Nottingham). He has taken full advantage of his lower turf mark in recent weeks with two wins from the last three starts. It was the Sandown victory last time that was most pleasing as he actually did it like a horse that is potentially capable of better still. One thing I love in sprinters in form and although he is up 5lbs, this race is no stronger that the Sandown one so I feel he has another good shout today. The early market has spoken in the favour of several others which means he is available to back at 11/1 in most places. Great chance. 1 pt each way at 11/1 generally. PHILBA – 3.10 Nottingham. Mick Appleby’s son of Cockney Rebel could not have been anymore eye-catching if he tried last time at Sandown. He will relish this step up in trip on handicap debut and in a moderate race I expect him to win well! BASEM – 3.55 Salisbury. Brother to Farhh that still looks very well treated off 95 now stepping up in trip. He has been well backed but I expect him to win so I will have a few shillings on but the main choice is to double him up with PHILBA. PHILBA/BASEM 3 pts win double that should pay around 6/1. Enjoy the day today. All work and no play for me!